Two 2016 graduates of the M.S. Applied Meteorology program at Plymouth State University, Klint Skelly (May 2016) and Allison Young (December 2016) advised by CW3E Affiliate Dr. Jason Cordeira, worked collectively on understanding the fraction of floods, flash floods, and debris flows (termed high-impact hydrologic events, or HIHEs) that are associated with landfalling ARs in California. Key Results: A total of 1,415 HIHE reports in California during the 10-year period of study reduced to 580 HIHE days across the different National Weather Service County Warning Areas (CWAs). A large majority (82.9%) of HIHE days occur over southern California; however, a larger fraction of HIHEs are associated with landfalling ARs across northern California (80.8%) as compared to southern California (41.8%). 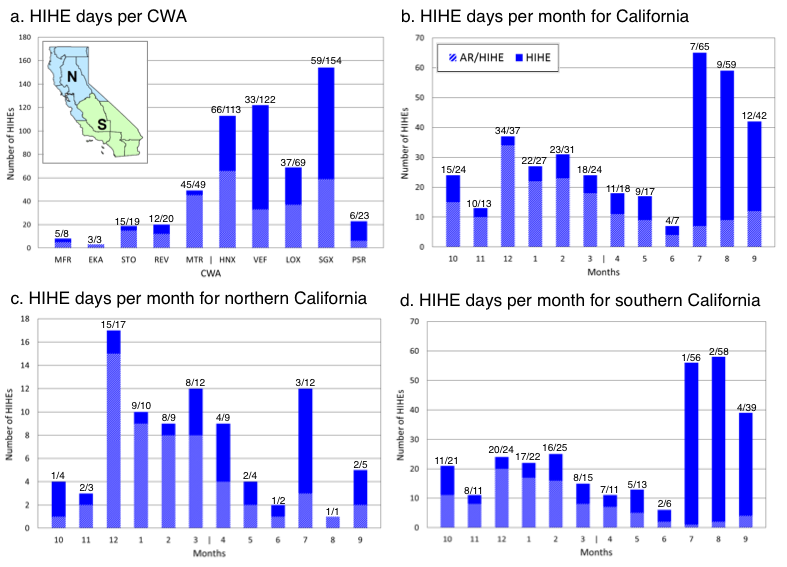 The 580 HIHE days across the different CWAs, when combined, reduced to 364 unique HIHE days for the state of California. A larger number of HIHE days statewide occur during summer (57.1%) as compared to winter (42.9%). Conversely, a larger fraction of HIHE days associated with ARs occur in winter (78.2%) as compared to summer (25.0%), which corresponds to similar values obtained by Neiman et al., (2008) and Ralph and Dettinger (2012). Figure caption: Total number of HIHE days per (a) CWA and (b–d) month for (b) all of California, (c) northern California, and (d) southern California. The blue bars and denominator represent the total number of HIHE days, whereas the white hatched bars and numerator represent the total number of HIHE days associated with ARs. The 580 HIHE days across different CWAs, when combined by region, reduced to 88 unique HIHE days for northern California and 301 unique HIHE days for southern California. A larger number of HIHE days across northern California occur during winter (62.5%) as compared to summer (37.5%), whereas a larger number of HIHE days across southern California occur during summer (60.8%) as compared to winter (39.2%). The fraction of these HIHE days that are associated with ARs is higher over northern California (63.6%) as compared to southern California (39.2%). This study illustrated that HIHE days contained within the NCEI Storm Events Database for CWAs across California can be attributed to landfalling ARs and their associated precipitation extremes. This attribution is largely valid for HIHE days across northern California in the cold season and not necessarily valid for HIHE days across southern California during the warm season. Approximately 57% of all HIHE days in California occurred during the warm-season, mostly in conjunction with flash floods, and 75% of these HIHE days were not associated with ARs. The composite analysis of flash flood days across California illustrated the climatological warm-season flow pattern for precipitation across southern California and closely resembled the type-IV monsoon synoptic pattern as defined by Maddox et al. (1980). This result motivates additional future work that could focus on the role of the North American monsoon and other non-AR processes that produce HIHEs across California. Support for this project was provided by the State of California-Department of Water Resources and the U.S. Army Corps of Engineers, both as part of broader projects led by CW3E. Dr. Cordeira and his graduate students at Plymouth State University actively collaborate with CW3E on topics related to atmospheric rivers, such as analyzing, understanding, and forecasting their impacts along the U.S. West Coast.